Sami Zayn made his big return to WWE during the RAW After WrestleMania. He turned heel on the crowd after losing a contest for the IC Title and then he appeared on SmackDown Live the next night to inform fans that they weren’t worth a promo from him. The WWE Superstar Shake-Up is bound to see Superstars find new homes on the WWE main roster. We previously reported that 8 free agents are set to get new homes and we can apparently add one more in Sami Zayn. 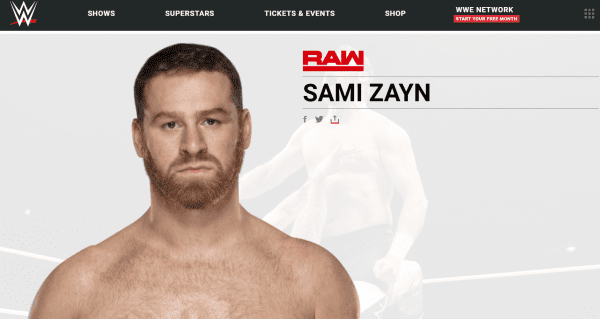 WWE’s website still lists Zayn as a RAW Superstar on his official profile. However, Zayn is listed as a free agent in a video recently produced by WWE for the Superstar Shake-Up. We will have to see where Zayn ends up, but if he is to change brands, then he might find himself playing for the blue brand once again.